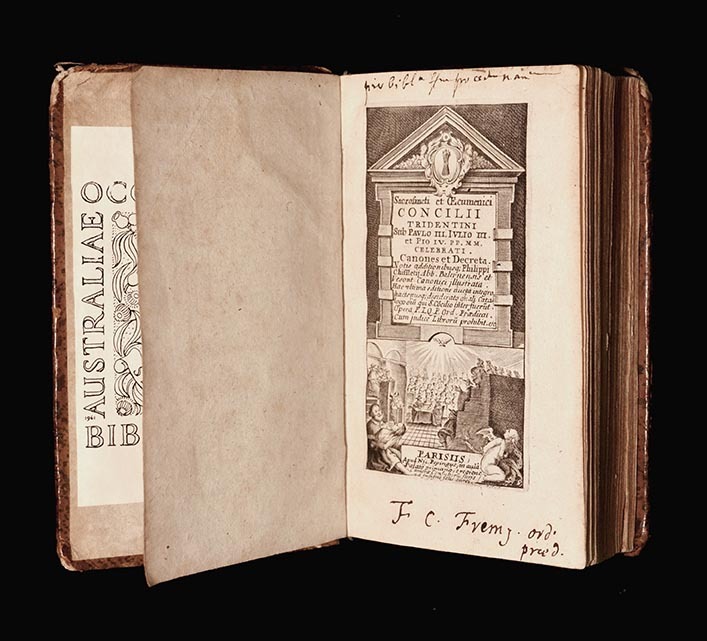 Special Collections' main themes are Rare materials, Australian Literature, Indian Ocean Maritime History, Literature and Theatre and the University. Materials from the collection can be found in OneSearch and must be viewed in the Special Collections reading room. Special Collections is located on the 2nd Floor in the Reid Library and may be consulted on request by anyone with an interest in the material. Photographic ID is required and the material can only be photographed. Some collection materials may have access restrictions or other conditions, so we recommend that you plan in advance and contact us prior to your visit to facilitate your research. The Rare materials collection is composed of works of European history, literature and theology of the medieval and early modern periods, philosophy, voyage and settlement works, early 16 and 17th century maps, and facsimile publications of religious and early manuscripts. A significant number of the books in the collection were donated by the Friends of the Library. 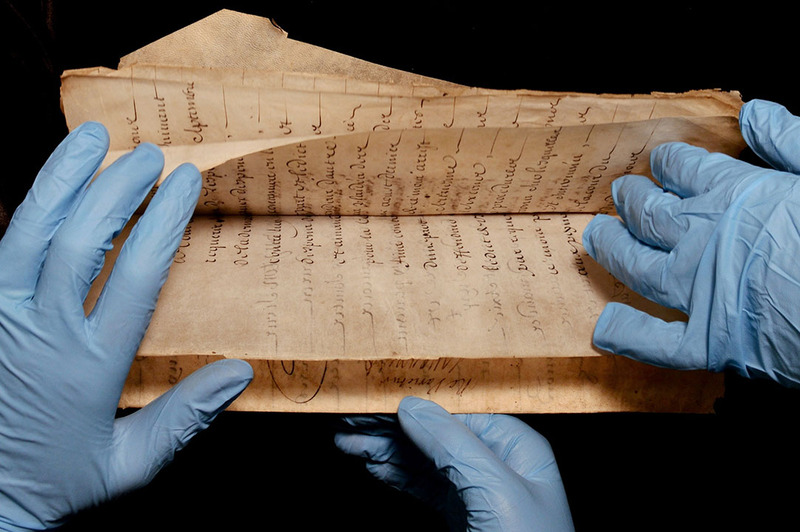 Special Collections holds a range of manuscript material, items from the pre-printing era, printed works in their original manuscript form, and personal papers. 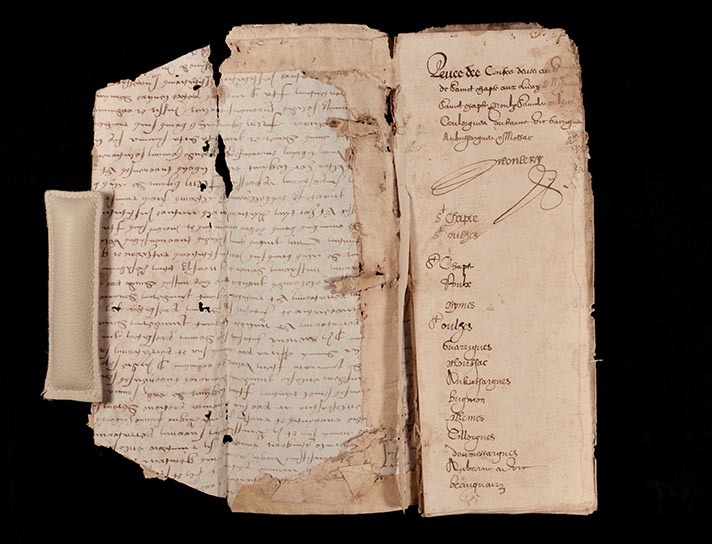 Included in the Manuscript Collection are Australian literary works, correspondence and medieval manuscripts. The Australian Literature Collection is comprised of literary works published in Australia or by Australian authors up to 1980. The Peter Cowan Collection is especially strong in literary works of the later nineteenth and earlier twentieth centuries. It also includes material on Australian history, exploration, art and natural history. The William Grono Collection of Western Australian Poetry is comprised of poetry by WA authors published from the 19th century onwards. The Indian Ocean is an integral part of the history and contemporary life of Western Australia. Shipping and trade, colonial and imperial histories are the themes of this collection which include materials collected by Indian shipping executive David Solomon Erulkar and UWA Professor Frank Broeze. The Erulkar Collection focuses on the history of the Eastern Indian Ocean region, especially the maritime history of India and includes rare books, manuscripts and journals. The Broeze collection focusses on maritime history and shipping. It includes a considerable amount of Dutch and German material and more general books on modern political and economic history. The strengths of the collection are early mapping of the region, Indian politics, ship-building and ethnography. It is well represented with many of the best known authors on the subject, particularly those of the late eighteenth- and early nineteenth-centuries – Dalrymple, Forbes, Marsden, Raffles, Sonnerat, Elphinstone and Valentia. In the Manuscript collection the Marchant Papers and the Melville Papers relate to the Indian Ocean region. In addition to the Australian Literature Collection are several named collections in the field of literature and theatre. The Somerset Maugham Collection includes copies of all Maugham’s major works including first and limited editions, proof copies, books from Maugham’s own library and ephemera. The King Collection is comprised of twentieth-century English literature, primarily poetry including first editions of Auden, Eliot, Joyce and C. Day Lewis. The UWA Centenary Theatre Collection assembled by UWATCH (UWA Theatres on Campus History) was presented to the Library as a centenary gift in 2013. The collection comprises programmes, posters, photographs, reviews and costume designs for UWA thetare productions by students and graduates. The Playhouse Collection includes copies of plays, programmes, playbills, posters and reviews from the mid 1950s – 1982. These collections include published material by the University and publications about the University. Unpublished administrative records and selected personal papers from UWA academics are held by the University Archives. The Thesis Collection is not available for loan and theses can be viewed only in the Reid Library or Special Collections. There are various access options are available through OneSearch. Check our Request and recommend page for more information. UWA Publishing, copies of all publications dating from 1935 from UWA Press, now known as UWA Publishing are held in Special Collections. The Friends of the University of Western Australia Library, known as 'Friends', have been supporting the Library since 1963 and is the oldest University support organisation. Funding is raised through membership of the Friends and from attendance at the monthly lecture series at which non-members are charged a small fee. Over the years speakers have ranged from eminent people to young researchers who have shared their enthusiasm for their subject or field of expertise, communicated in a way that can be enjoyed by a general audience. Writers, historians, artists, musicians, scientists, mathematicians and many others have covered a diversity of topics since the Friends of the Library was founded over fifty years ago. Meetings take place on the second Tuesday of each month from March to November in the Reid Library. In the delightfully old-fashioned college tradition, the Friends offer sherry at 7.00pm before the lecture begins at 7.30pm. The Friends of the University Library offers a companionable opportunity for those who enjoy the pleasure of broadening one’s interests and meeting people who enjoy communicating their enthusiasm for their subject. The Friends generate interest in the Library, acquire donations to support services and collections, and members are eligible for Friends benefits. An invitation to the annual Christmas party held in the Library. You can become a Friend of the UWA Library for 12 months, $30 for an individual and $50 for a family. Any other donation is tax-deductible. Further information can be obtained from Kathryn Maingard by phone or email. Gifts are accepted on the understanding that items not selected for inclusion in the collection will be disposed of at the Library's discretion. Donated material is integrated into the existing collection, and is subject to the same conditions of use. Gifts are not normally accepted if the donor wishes to place any limitations or restrictions on their use or disposal. Donations become the property of the UWA Library, and may not be claimed back at a later date. We do not normally accept items or collections on long-term loan. A UWA Gift Agreement must be completed for donations of significant collections or items. Where appropriate, bookplates with the donor’s name can be added to gift items. The Federal Government offers a tax deduction for significant cultural donations to libraries and archives. If you wish to donate, please contact the Special Collections and Archives Team. The Friends of the UWA Library are active in raising funds to buy rare and unique materials for Special Collections. These have included maps like the Polus Antarcticus of Jan Jansson (1650) and local artist Gareth Morse's drawings of the construction of the Duyfken replica. Unique items from the Library’s Special Collections are exhibited in two display cases located on the Ground Floor of the Reid Library. The Library thanks the Friends of the Library for their generous donation of one of the display cases. On 31 October 1517, Martin Luther sent his Ninety-Five Theses to Cardinal Albrecht of Brandenburg, the Archbishop of Mainz, criticising the Roman Catholic Church’s sale of indulgences. 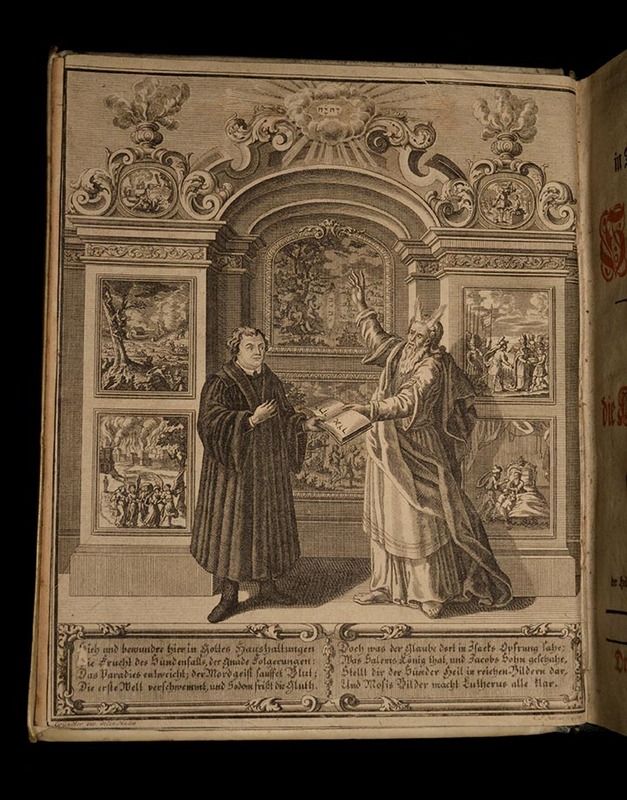 On the 500th anniversary of the beginning of the Protestant Reformation, this online exhibition is designed to help students explore how the reformation unfolded through the emerging phenomenon of print culture, through examples from the UWA Library Special Collections. Scholars from the Centre for Medieval and Early Modern Studies consider how the lives, images and thought of Luther, other Reformers and Catholic Reformation leaders were expressed in print, at a time when this fledgling media for communication was in rapid development. Text written by Susan Broomhall, Kirk Essary, Susanne Meurer and Arvi Wattel. Photography by Kate McVey and Rosie Inglis, UWA Library. This collection of medieval and early modern manuscripts, held by the Vitalis family in the south of France, provides examples of who created manuscripts and how they were used in the age before print technologies existed. They also reveal the material and social interplay of animal and human interactions in interesting ways. 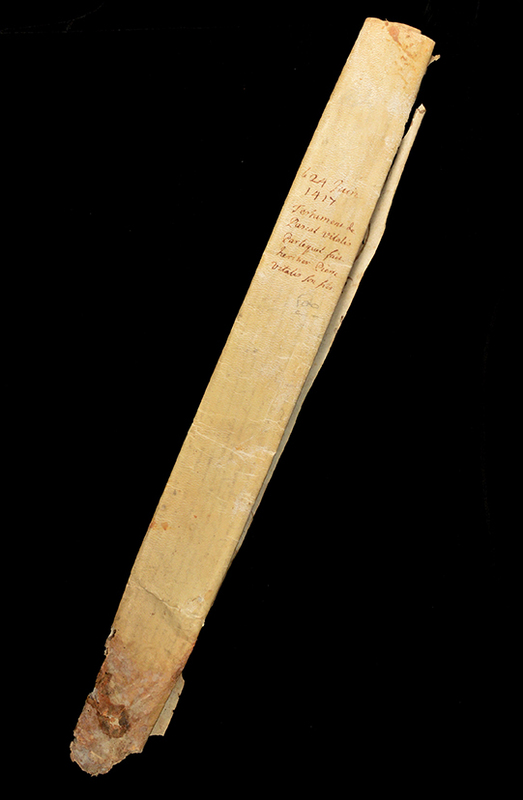 The oldest manuscript in this collection is the will of Pascal Vitalis in Latin, dated 24 June 1417, in which he left his goods to his son, Pierre. 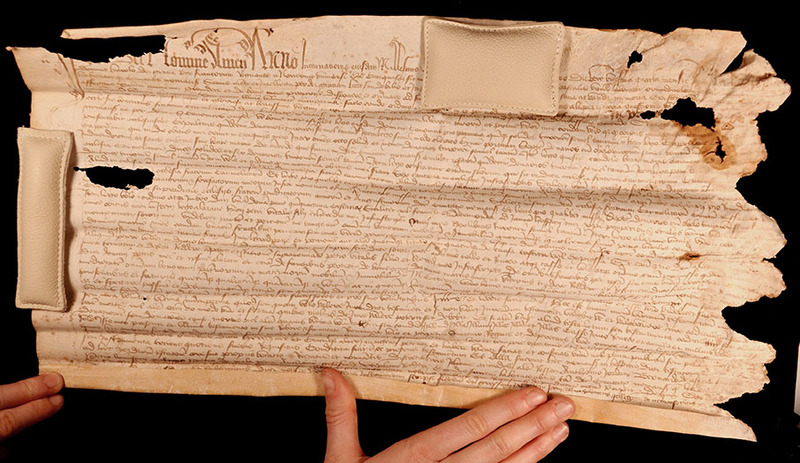 This document was written on prepared animal skins known as membrane, a long-lasting material that was highly suitable for an important legal text that needed to be retained by subsequent generations. 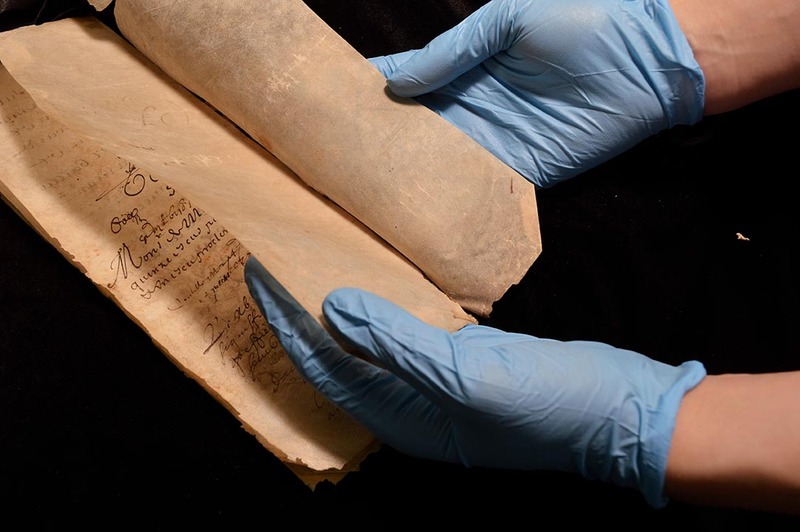 This is quite a stiff membrane, a kind of parchment that was usually made from the skin of animals bred in close proximity by humans such as cows, sheep and goats. It has spent so long in its tightly closed form that it is now difficult to unfold to read without a number of pairs of hands. Another example from the mid-sixteenth century shows how paper and animal skins could both be used in a hybrid material and textual form. Papermaking became widespread in Europe by the fifteenth century. Paper was usually made from recycling textile fibres, rather than wood pulp that is more commonly used today. Paper was far cheaper than animal skins and thus was more suitable for information that needed to be communicated immediately. This document, in French, records a list of who has paid taxes within the region, information that was certainly important but which would most likely be collated into official documentary sources. 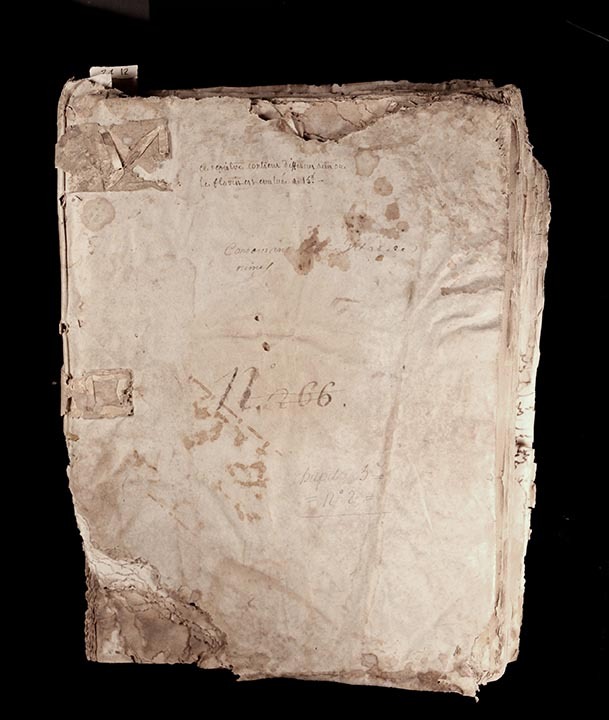 However, as the collection and recording of taxes might have required travel across the region, the paper text has been bound in a cover made from a recycled document written on membrane that gave it better protection from the elements and in movement. 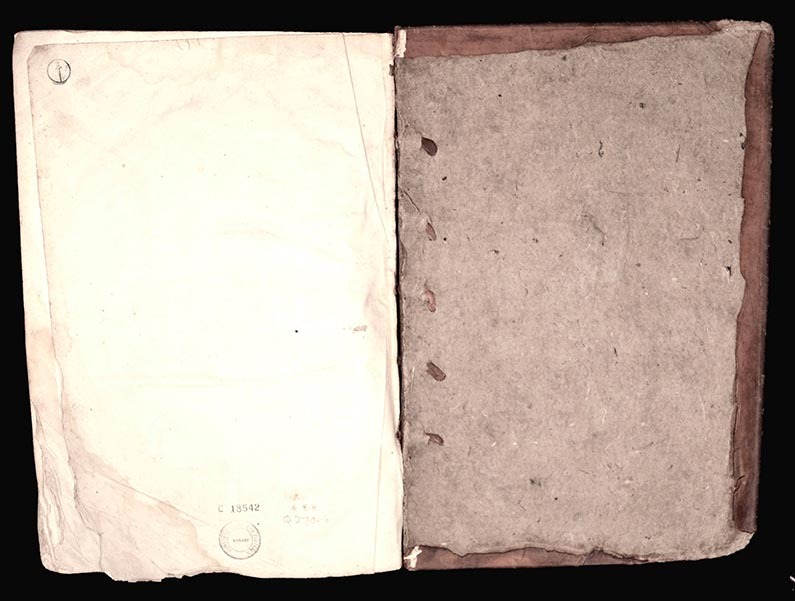 Membranes retained their significance as the appropriate textual support for key legal and financial documents, even in print societies. 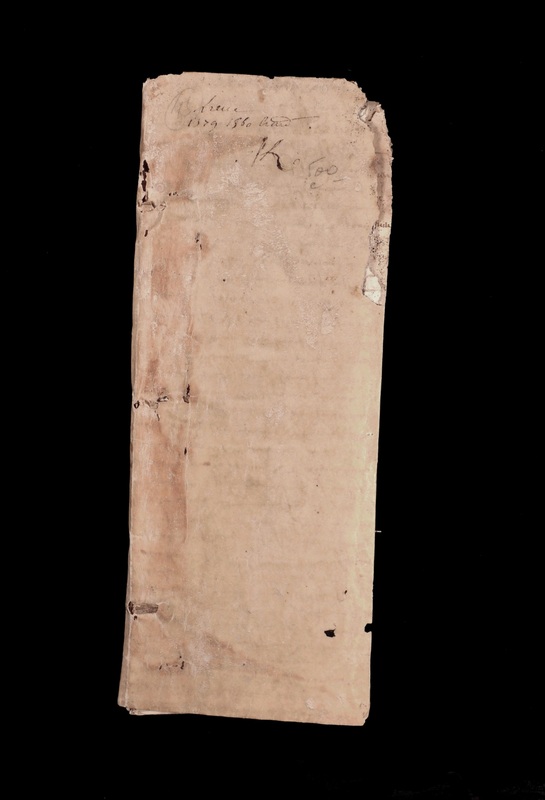 This seventeenth-century contract, in French, has been recorded on a very fine quality membrane, perhaps vellum – a term that is used for very fine, prepared skins of, usually, young calves. The modern English term, veal, comes from the same Latin origin. Beyond choosing the right kind of textual support for information, a range of different covers could be made to protect the precious knowledge within. 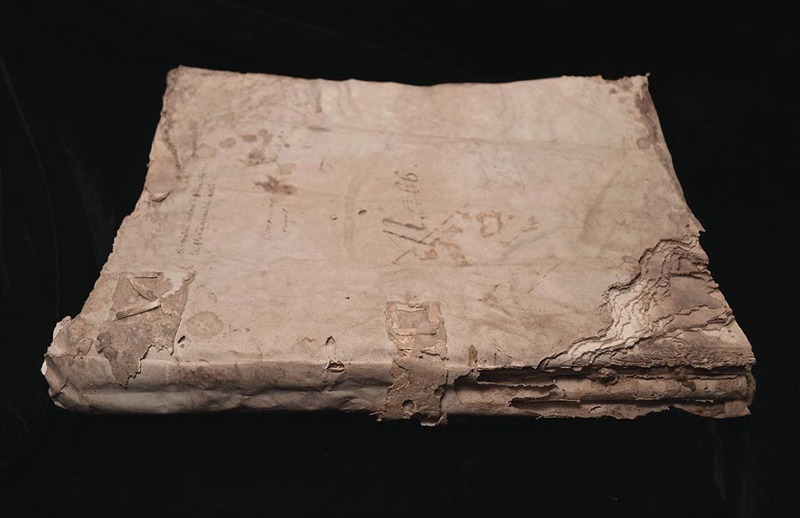 Several of the manuscripts dating from the mid-sixteenth and seventeenth centuries in the Vitalis collection are handwritten on paper but bound in animal membranes that were hardy and served as well-wearing protective covers. 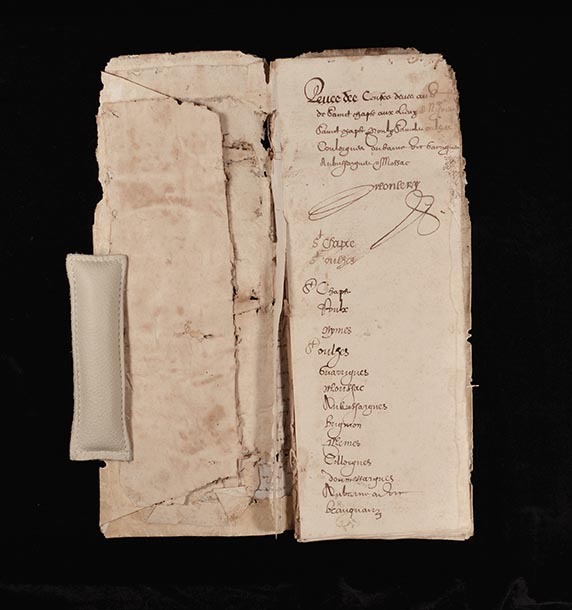 This particular example still retains parts of the original leather buckles that once kept the document inside safe from the elements. 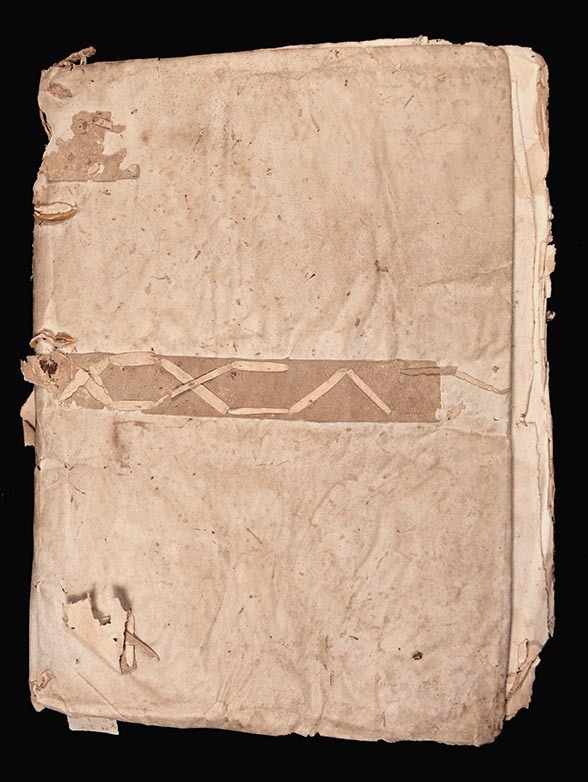 As this text shows, old manuscript texts on membrane that were no longer perceived to be relevant might find a new life as a front cover, protecting a new text. In a few cases, our only knowledge of a text comes from a copy that was preserved as a cover by later generations. 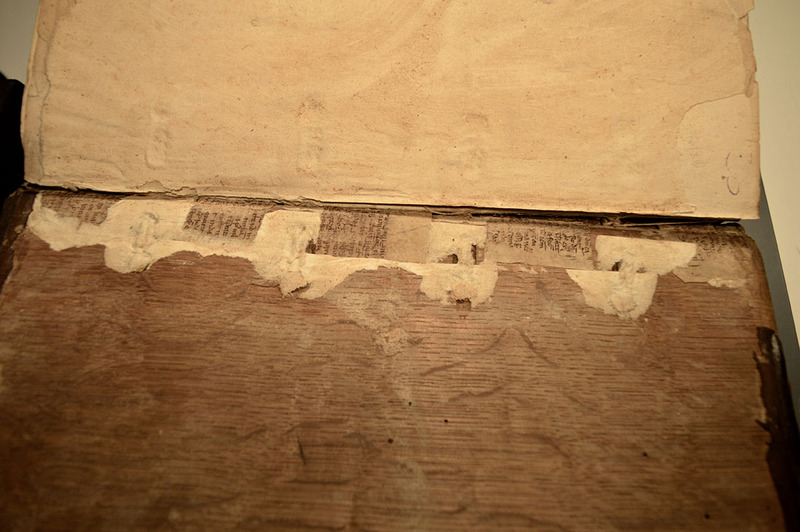 Sometimes, a hard wooden board could be used as a cover, and as with this example, the board could be itself covered with a thin layer of leather that protected the board. This English translation of Martin Luther’s ‘discourses at his table, &c., which hee held with divers learned men’, was published in London in 1652. For efficiency, covers themselves were often labeled and over time, became increasingly decorative. The front cover of this work, a first edition of volume three of Martin Luther’s complete works published at Wittemberg in 1549, has been finely tooled with biblical imagery and narratives. Here can be seen Adam and Eve. Its leather-bound wooden cover has metal closures for further protection. Such a book offers more than one way to communicate its message even before one looks inside. These reproductions combine two important elements of religious practices at the time Martin Luther (1483–1546) was developing his theses. They are printed copies of what were known as indulgences. In Roman Catholic Church theology of the later middle ages, Christ and saints had accrued what we might think of as ‘extra credit’ stored in a treasury of merits that could be used to offset an individual’s sin. By performing a specific spiritual action such as prayers or good works, it could permissible to receive a remission of time to be spent in penance for a particular sin. Indulgences became so widespread and popular that there were official Church pardoners to regulate the system and early printers realized that there was money to be made by pre-preparing paper slips complete with blank spaces in which the relevant, specific details could simply be hand-written. This particular example was printed by one of the best-known early printers, Johannes Gutenberg (c. 1400–1468), working in Mainz, now in Germany. He is perhaps best known for his role in the introduction into Europe of moveable type and varied innovations to the printing press. Gutenberg had a range of skills from his work as a blacksmith and goldsmith and knowledge of contemporary wine presses that he combined in the development of print. By creating individual metal type for each letter, which could then be set in whatever order the text required in a mould, an infinite variety of texts could be set rapidly. Previously, a large section or page of text would be carved into a single wood block. Metal type was more durable, and individual letters slotted into a mould gave far greater flexibility. 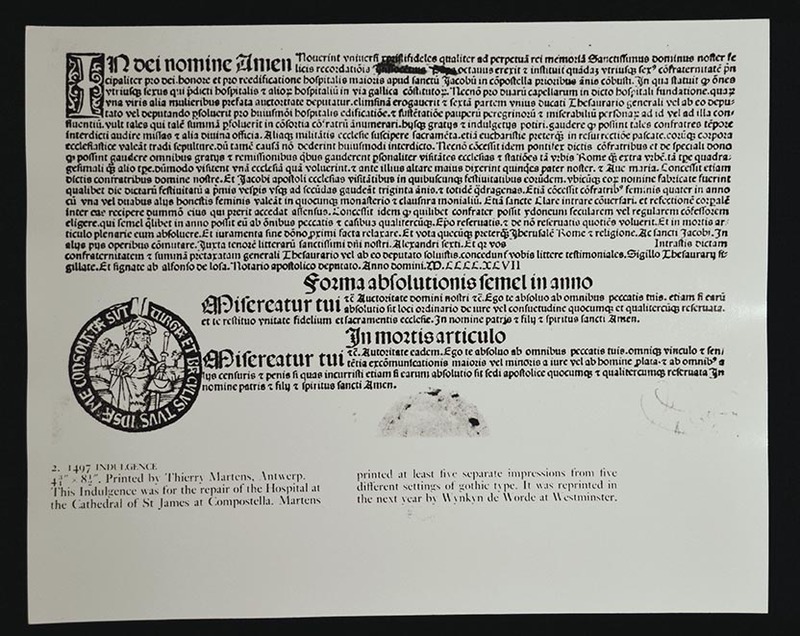 Once the mould was set up, any document that needed to be reproduced in large quantities, just like these indulgences, could be printed relatively cheaply and efficiently. The market for printed indulgences was by no means limited to Gutenberg and his fellow publishers in Mainz. 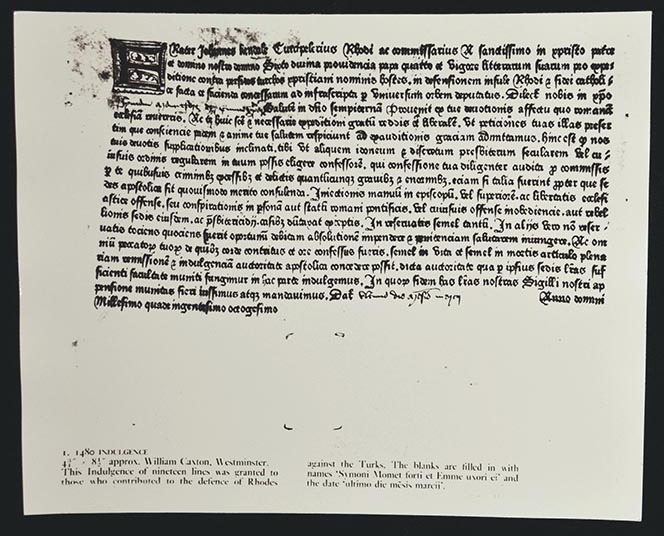 In this example printed at Westminster in 1480, we see the earliest printer operating in England, William Caxton (c. 1422–c. 1491), producing the same mass texts for the English religious market. The sale of indulgences within the Roman Catholic Church was a key target of reformers, particularly Martin Luther (1483–1546). In 1515, Pope Leo X (1475–1513) began to offer indulgences as a way to gain funds for his planned re-building project in Rome, St Peter’s Basilica. Martin Luther saw this practice through the activities of Johann Tetzel (1465–1519), the papal commissioner of indulgences for the dioceses of Magdeburg and Halberstadt, who was an enthusiastic proponent of the scheme. Moreover, half the funds raised did not reach Rome but were instead diverted to the Archbishop of Mainz and Magdeburg, Cardinal Albrecht von Brandenburg (1490–1545), Tetzel’s employer. 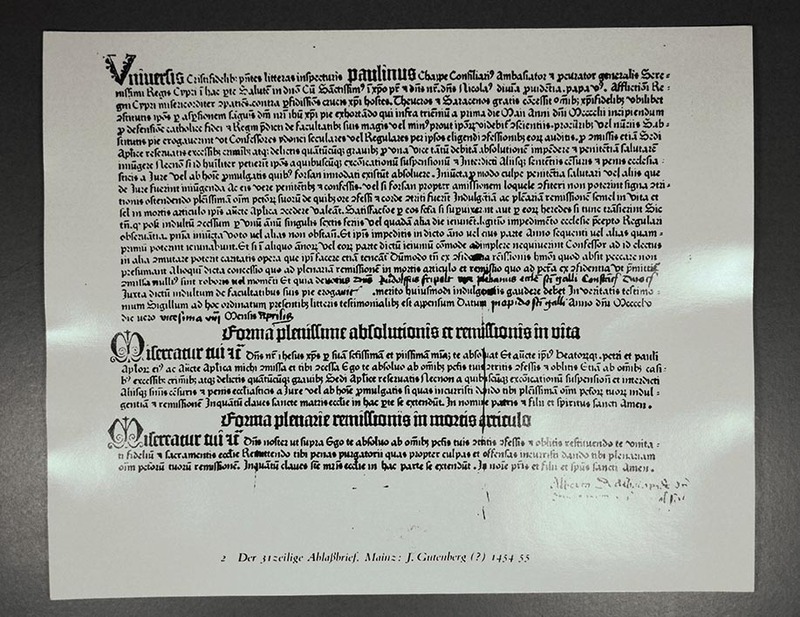 On 31 October 1517, Luther wrote to the Cardinal to complain of this abuse, including a copy of an academic essay, or disputation, that he had written in Latin questioning the power of indulgences with 95 different points, or theses, to his argument. This disputation has become better known as the Ninety-Five Theses, one of the founding documents of the Protestant Reformation. Within weeks, Luther’s work was widely published in Germany, in Latin and then translated into German, and, by 1519, the work was available widely in Italy, France and England. Erasmus of Rotterdam (c. 1466-1536) was one of the foremost intellectuals of the European Renaissance as well as a major figure involved in the religious controversies surrounding Martin Luther’s Reformation. In 1516 he published a Greek edition of the New Testament with a revised Latin translation, a significant and controversial achievement as it stood against the Vulgate Latin version, which had been the predominant version of Scripture in Western Christendom for over a thousand years. His new version would come to heavily influence Protestant exegetes (including Martin Luther (1483–1546)) and would embroil Erasmus (who remained a Catholic) in endless controversy with more conservative Catholics until the end of his life. 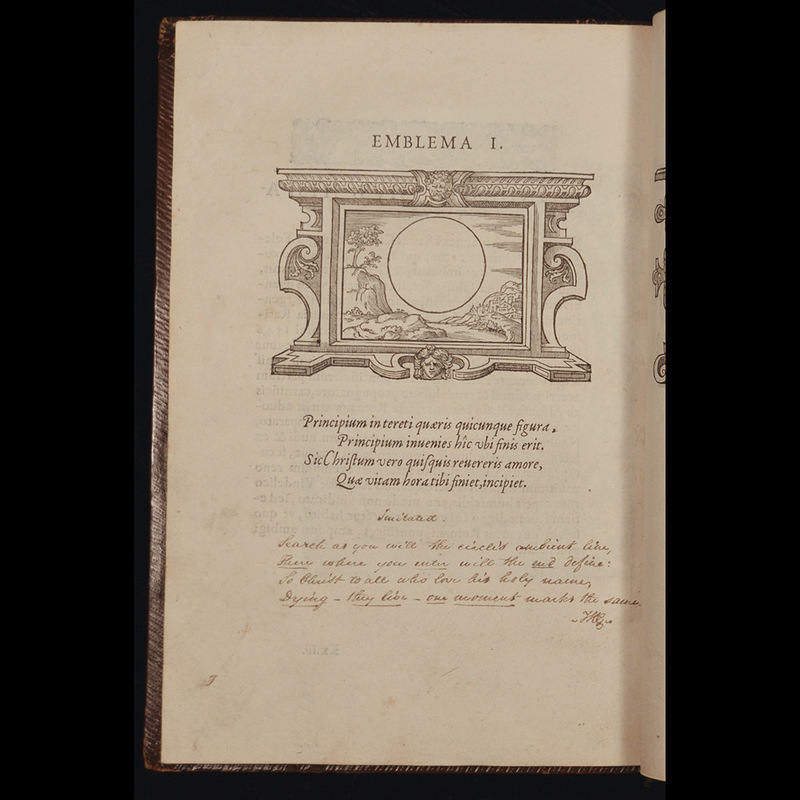 The Moriae Encomium, or In Praise of Folly—first published in 1511 and revised in 1515—was one of Erasmus’s most famous works. The work, an occasionally scathing satire, was written in the voice of Dame Folly, who encourages her many earthly followers (ironically) to continue in their mad ways. Erasmus (or Folly) pulled few punches in the work, which targeted established religious and political institutions. The most relentless criticism is reserved for lazy and gluttonous monks and hubristic theologians who write in the most abstruse scholastic mode. Similar criticisms would be taken up by Protestants against their Catholic counterparts, and the work would thus further implicate Erasmus himself in the schism which ensued from Luther’s Reformation. 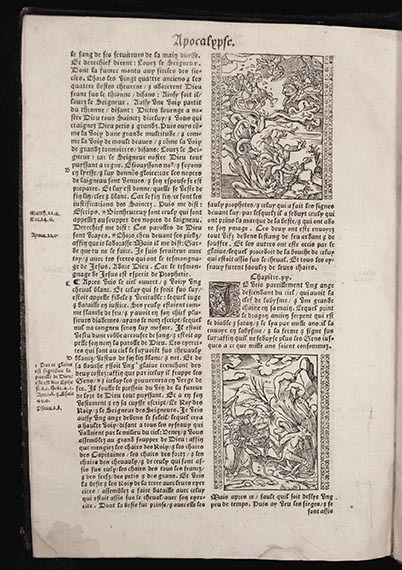 The images here represent two different editions, both of which include a commentary on the text by Gerardus Listrius (a colleague of Erasmus’s), but in rather different formats (illustrating the malleability of the printed text in the early modern period). The later version was bound (rather uncommonly) with a letter written by Erasmus against Luther, which is a response to a calumnious attack on Erasmus by the German Lutheran published first in 1534. Luther had accused Erasmus of the ancient heresy of Arianism—for Erasmus had suggested that the doctrine of the Trinity could not be found in its entirety in the Bible itself—and referred to him as the diabolum incarnatum (“the devil incarnate”). Erasmus responded with a spirited defence of his theological program and suggested that Luther’s insistence on sola scriptura was self-defeating for one always had to interpret and expand upon ambiguities in the biblical text whether they admitted it or not. This would remain an aspect of the complex legacy of 16th-century theology and biblical interpretation to the present day. In 1535, Erasmus of Rotterdam (c. 1466-1536) published his last major work, an enormous manual for preachers entitled the Ecclesiastes sive de ratione concionandi, or The Preacher, Or On the Method of Preaching. It is recognized as a watershed in the history of rhetoric for its comprehensive nature and its ambitious attempt to render the rhetorical rules of classical and Christian antiquity (it is especially indebted to Quintilian’s Institutio Oratoria and Augustine’s De doctrina Christiana) appropriate for the approaches to preaching in the sixteenth century. The art of preaching had always been important in Christian thought, but it took on new significance in the sixteenth century as Protestants imagined the sermon to occupy the absolute centre of Christian teaching. The Ecclesiastes reveals Erasmus’s own strong feelings about the importance of the preacher and the sermon, and reminds us that many Catholic reformers sought similarly to emphasise the importance of preaching. 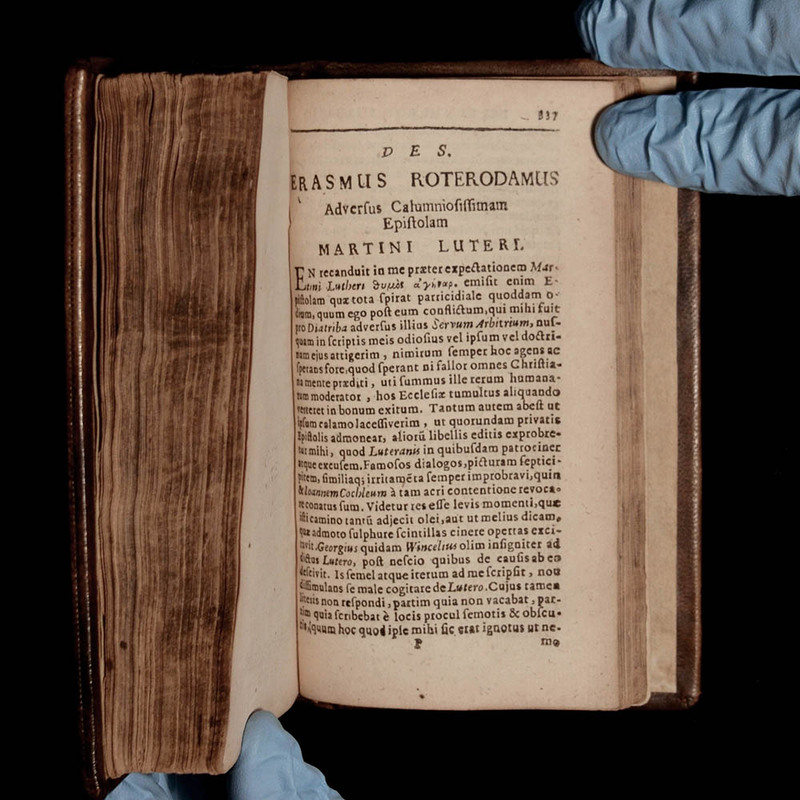 It is a work of extraordinary breadth, and in it Erasmus attempts to deal with nearly every conceivable issue a preacher might face in approaching the pulpit, from his own moral standing to the appropriate way to use his hands in gesture. It also lays out extensive advice on the best way to move the emotions and how to employ an array of figures of speech in order to sway the congregation. It was published rather hastily on account of the fact that Erasmus did not have the energy, in his old age, to make the appropriate edits. It is thus somewhat unwieldy and perhaps overly long. Nevertheless, it was widely printed and its influence can be discerned in sacred rhetorics written subsequently by both Protestants and Catholics well into the seventeenth century. Jacques Lefèvre d’Etaples (c. 1455–1536) was a Roman Catholic theologian and humanist whose views found resonance with the Protestant reformers. Although some of his works were condemned for heresy, Lefèvre d’Etaples found support at the French royal court under the protection of the King of France, Francis I (1494–1547) and his sister, the author Marguerite d’Angoulême (1492–1549). Lefèvre d’Etaples was controversial because he translated the Bible into French, a language in which it could be read by many more people than as a Latin work. His was the first complete translation in French. 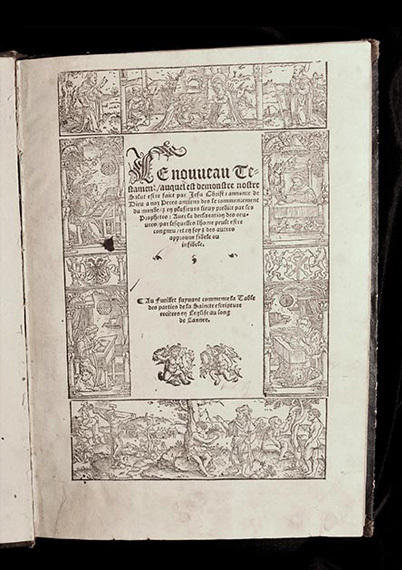 This example is an edition from 1534 of his New Testament. As can be seen here on the frontispiece, these works were targeting a new readership through their language choice and presentation of images to accompany the text. Here, readers could see as well as read in gothic script the fate of the damned at the Apocalypse in the Book of Revelation. This was part of a spiritual and intellectual movement that believed the word of God should be shared widely, and not remain in the hands and knowledge of just an intellectual and official Church elite. 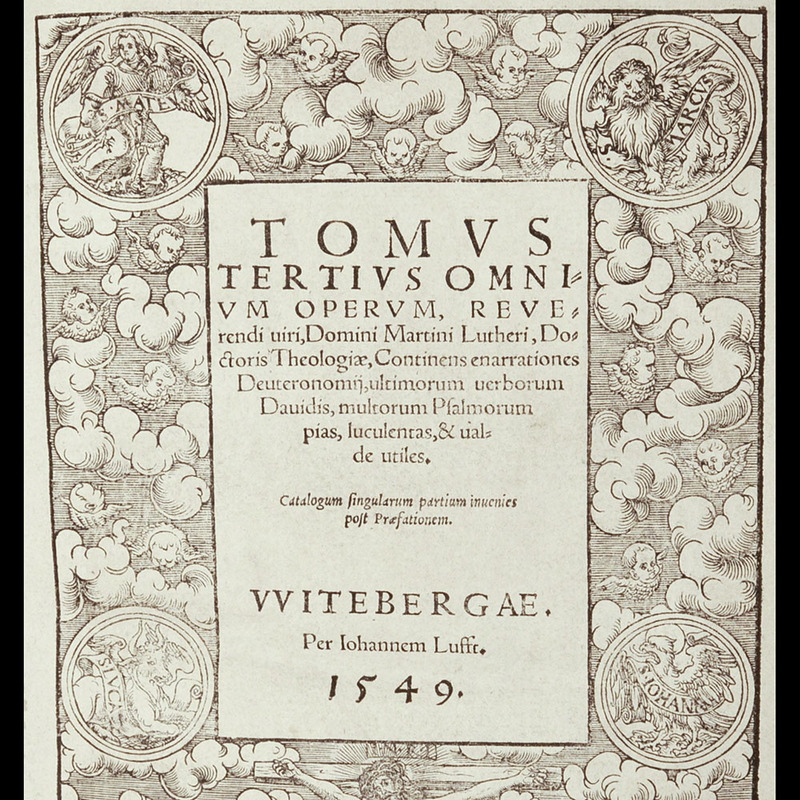 Lefèvre d’Etaples’ translation of the New Testament caused a sensation when it was first published in 1523. 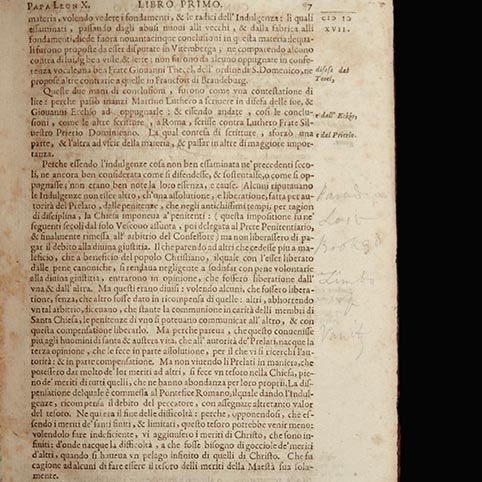 Although the theologians at the University of Paris condemned the work and sought legal restrictions on any further translations, it was commercially very successful. At the same period, Martin Luther (1483–1546) was translating the Bible into German, and a complete German Bible would follow within a decade, in 1534. Philip Melanchthon (1497–1560) is still an underappreciated figure from the Reformation. An eminent humanist, he was lured to Wittenberg, where Martin Luther (1483–1546) was based, from Tübingen to serve as Professor of Greek at the University of Wittenberg at the young age of 21. He was Luther’s right-hand man in many ways, and did much of the early intellectual heavy-lifting of the Lutheran Reformation. While certainly interested in theology, Melanchthon had wide-ranging interests and regularly lectured on classical Greek literature at the university. Also distinguishing him from other major reform-minded humanists at the time was his interest in Aristotelian dialectic, a mode of teaching and argumentation that Erasmus of Rotterdam (c. 1466-1536) and Luther, for example, blamed for what they perceived to be the denigration of theology in the Middle Ages into abstruse speculation. 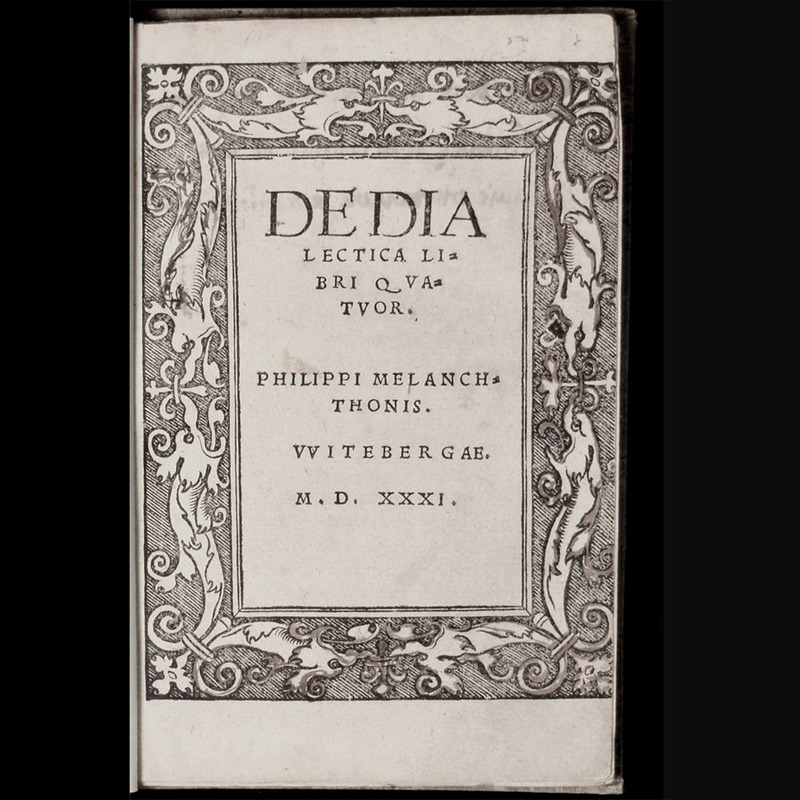 The dialectica libri quator, first published in 1528, is a defence of the usefulness of dialectic for students of rhetoric and theology, and a compendium of the various aspects of Aristotelian logic as it had been refined in the Renaissance. John Calvin (1509–1564) was, next to Martin Luther (1483–1546), the most lastingly influential Protestant thinker from the sixteenth century. Born and raised in France, he eventually fled persecution and ultimately landed in Geneva, Switzerland, where he came to exert enormous religious and political influence over the city, which had opened its doors to Protestant refugees, like Calvin himself, fleeing persecution (primarily from France, but also from England and Scotland). The Institutes was Calvin’s theological masterwork, and it established a distinctive brand of Protestant thought that emphasised the absolute power of God and the absolute sinfulness of humanity, which spread rather quickly across Europe and into the Americas in the sixteenth- and seventeenth-centuries. 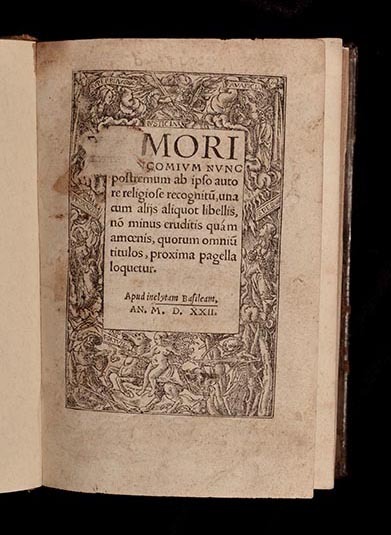 The work was first published in 1536 and expanded over several editions until the final version of 1559. 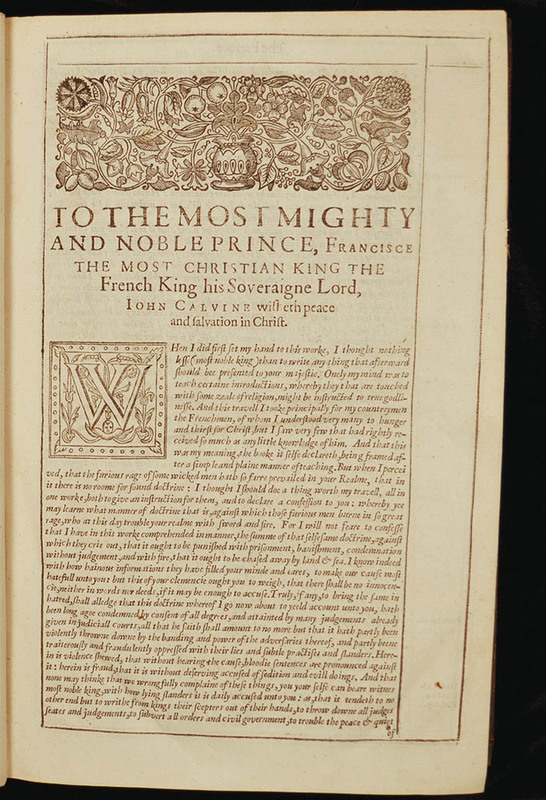 From the first edition, it opened with a letter to Francis I (1494–1547), king of France from 1515, imploring the king to cease his persecution of Protestants in France (to no avail). Written originally in Latin, Calvin translated the work into French and it is a signpost indicating a shift to the modern form of that language. 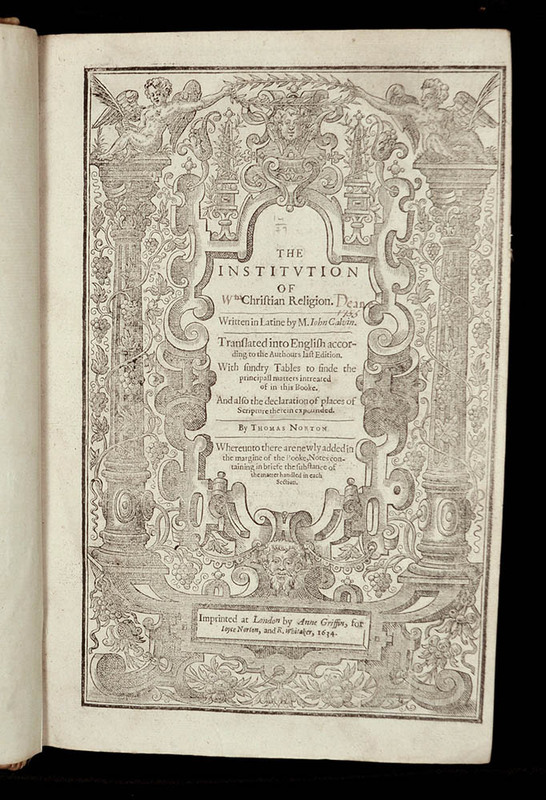 The Institutes was first translated into English in 1561. Though the Institutes itself and Calvin’s thought more generally is heavily indebted to Luther’s emphasis on the centrality of faith, grace, and the Bible, Calvin diverged from Lutheran teaching on the Eucharist and certain ecclesiastical aspects of theology. Thus, Swiss Protestantism associated with Calvin became a separate movement, leading eventually to serve as the bedrock for Puritanism and Presbyterianism in England, the Netherlands, and America, as well as other branches of Protestantism now usually termed ‘Reformed’ or ‘Calvinist’. All reformers spoke out strongly against the worship of images. Yet, while some reformers including Karlstadt and Zwingli wanted to forbid all images, Luther and Calvin acknowledged the usefulness of images as an educational tool. Théodore de Bèze (1519-1605), Calvin’s successor in Geneva, even recommended the use of images to encourage piety. In 1580, Bèze published the Icones in Geneva with his friend, the printer Jean de Laon. 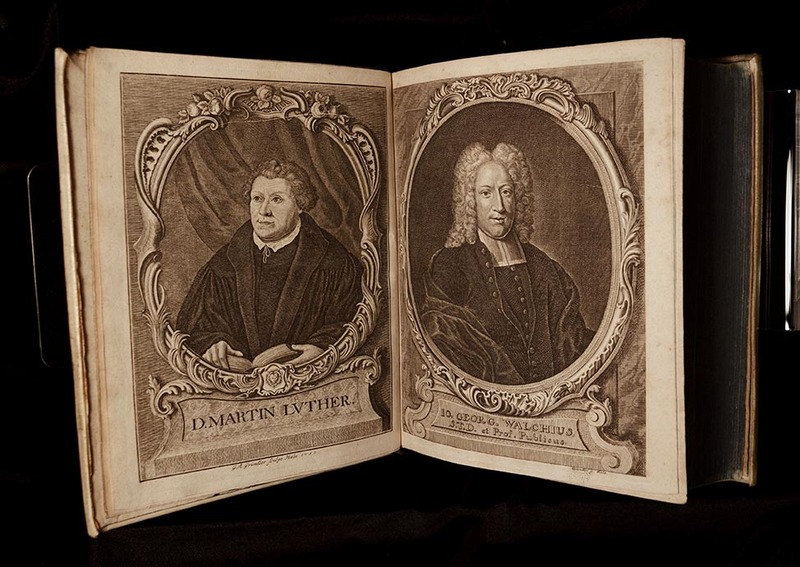 The book contains short biographies of Reformers (including Luther, Zwingli, Calvin, Erasmus and Melanchthon) and their sympathizers, alongside 38 woodcut portraits and 54 empty, but labelled woodcut frames for individuals whose portraits Bèze had been unable to obtain. Bèze had searched for likenesses of religious leaders since at least 1577 and continued his mission after the book’s publication. Even though the Reformed movement was deeply divided on numerous theological issues, Bèze intended to create an idea of Protestant unity and sought to portray the reform movement as an international phenomenon. Bèze was aware that the inclusion of images might provoke criticism, since the Protestants had come out so strongly against Catholic idolatry, but he stresses in his introduction that readers would be more receptive to the reformers’ message if they saw their pictorial likeness. It is not surprising that you commend statues so freely, since you yourselves are statues, oh priests. After Patten, the copy came into possession of Albert Ehrmann (1890-1969) whose armorial bookplate with his motto “pro viribus summis contendo” (‘act according to your strength’) is pasted on the front page. Ehrmann was a diamond merchant, who built one of the most important private book collections in Britain from 1920 onwards. After his death, major libraries such as the British Library, Bodleian Library and Cambridge University Library received parts of his collection, while the rest of his collection was sold at two sales at Sotheby’s in November 1977 and May 1978. It is likely that the Reid library’s copy of Bèze was purchased at one of these two sales. Luther’s open letter “To the Goat of Leipzig” forms part of a series of sharp exchanges between the Wittenberg Reformer and the Dresden chaplain Jerome Emser. Alongside Johann Eck on the Catholic side and Andreas Bodenstein for the Protestants, Luther and Emser had already faced each other in the Leipzig Debate of 1519, in which the doctrines of free will and grace and associated practices, such as the sale of indulgences, were discussed. Debate turned to feud, however, once Emser attacked Luther’s address “To the Christian Nobility of the German Nation” (1520) as un-Christian, prompting the present response from Luther. The eponymous “goat” is a reference to the ibex in Emser’s coat of arms. It was frequently invoked by Emser himself, when he warned opponents to “Beware or the goat will strike you!” in his publications. Once appropriated by Luther, however, the meaning of the goat-epithet switched from the formidable foe capable of dealing out devastating blows to an opponent debased by being likened to an animal. Animalization became a popular visual and verbal strategy of Reformation propaganda: Thomas Murnau, for example, was turned into a cat, while Johann Eck became a sow. Luther himself wasn’t exempt from such attacks. Emser thus addressed his response to the present pamphlet to the “bull of Wittenberg”. Although the word “libel” in the sense of a false or defamatory statement is not used until the seventeenth century, it has its root in the term used to describe such pamphlets in sixteenth-century Germany, the Latin “libellus”, meaning little book. 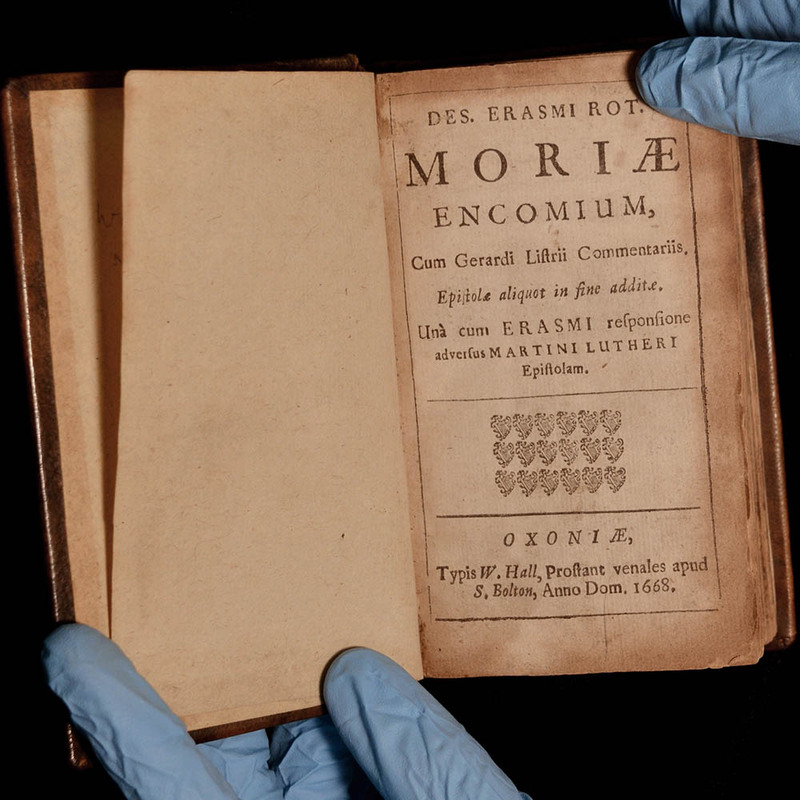 Pamphlets were usually produced in quarto format, measuring around 20 x 15cm, and rarely consisted of more than 16 pages. 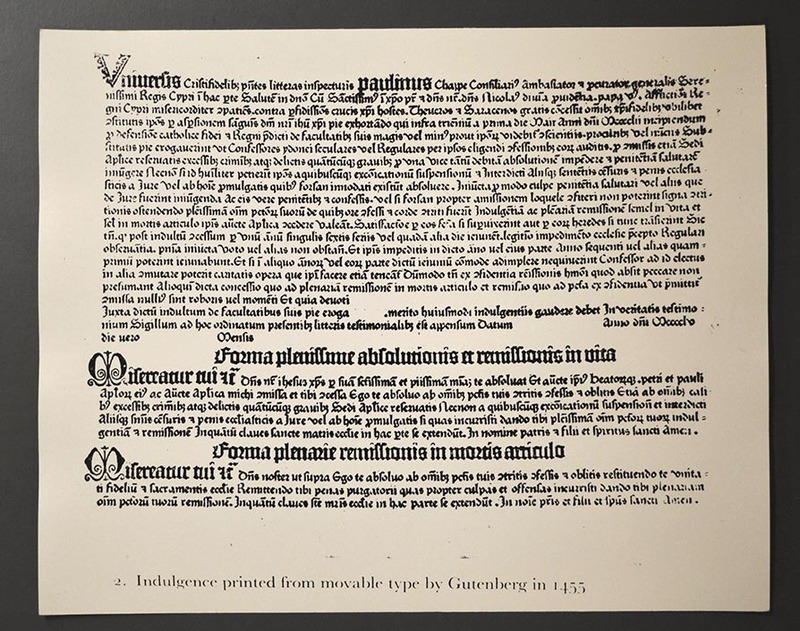 An experienced printer like Melchior Lotter, who had incidentally also printed Luther’s 95 Theses, could produce several hundred copies of a pamphlet within a day or two. Small, lightweight and cheap, such publications spread easily and quickly to other parts of the empire via merchants, and itinerant booksellers or preachers. Once they reached a new printing centre, other printers might reissue editions of popular texts. 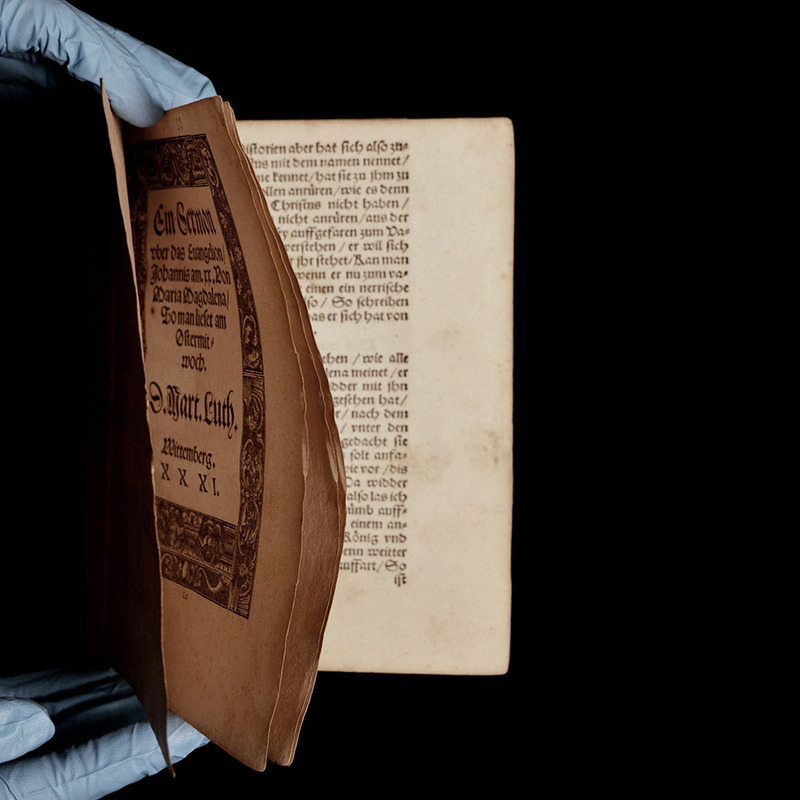 Estimates suggest that 1.5 million Luther pamphlets were printed in the first decade of the Reformation. The actual audience for these pamphlets probably would have been even larger. With literacy rates as low as 5-10%, reading was often a communal activity: pamphlets could be read out in public and the sermon-format, as well as the diction and rhythm of these published texts often imitated spoken language. This is the title-page to another open letter addressed to Luther’s opponent, Jerome Emser, the “goat of Leipzig”. As in the case of the title-border with resting lions that served as the cover for one of Luther’s 1523 sermons, this woodcut illustration was reused on the title-page of at least seven publications issued between 1520 and 1525. 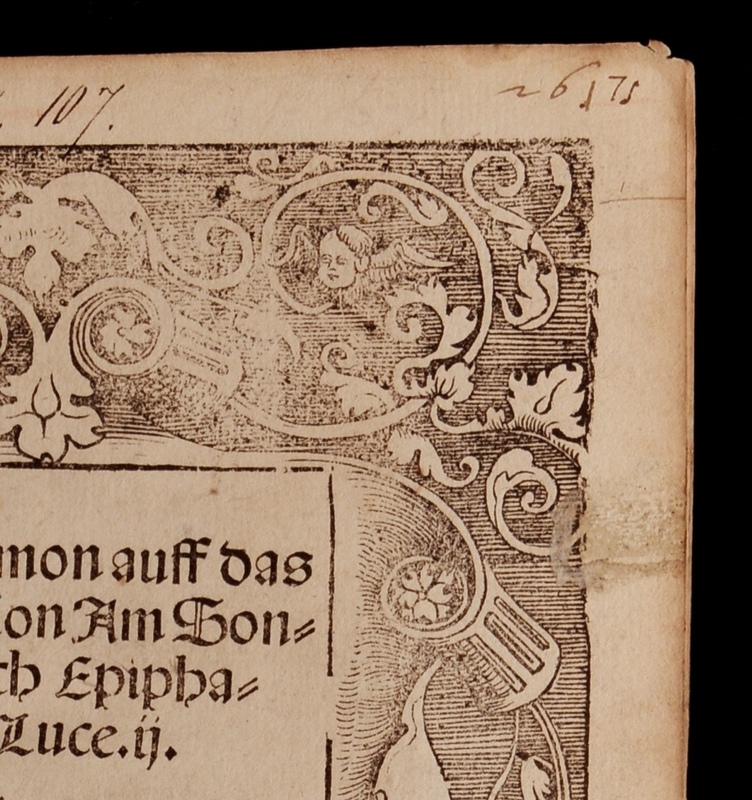 While Lucas Cranach had designed the title-border, the woodblock itself was owned by Johann Rhau-Grunenberg, who is identified here by the large initials “IG” in the lower margin. Grunenberg’s profession is illustrated in the bottom left corner, where one figure tightens the screw of the press to exert pressure on the woodblock in order to transfer image and text onto a sheet of paper. The printer’s companion is holding two dabbers, the rounded pads used for applying ink to blocks and type. The remainder of the border is filled with seemingly incongruous vignettes, from the drunkard whose head is circled by bees, or the poacher escaping with his prey, to attacks by a bear on a bull and by a wolf on a sheep. 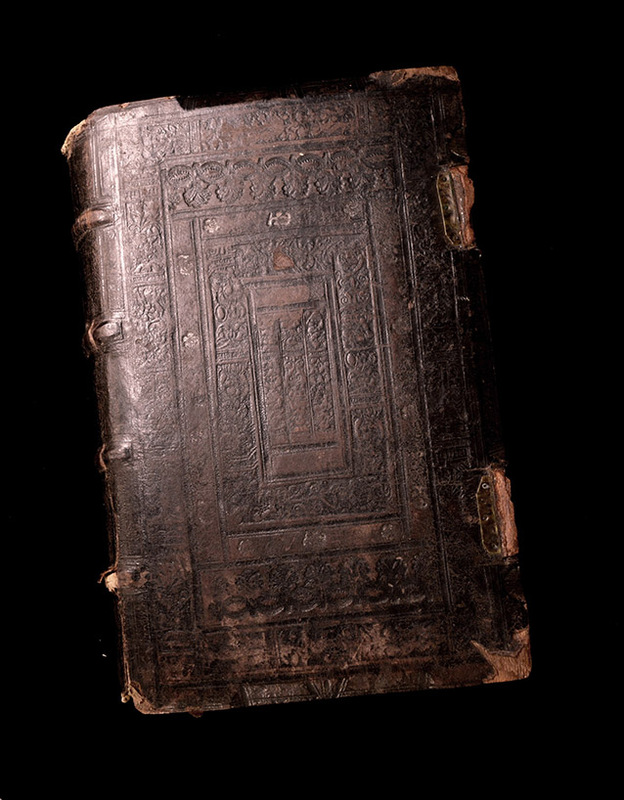 For their common denominator, we need to turn to the book that this title-border was initially commissioned for, a Trostbüchlein (1520) or “Little Book offering Comfort” written by Martin Luther for the ailing Elector Frederick of Saxony. The publication appeared around the same time as work was underway in Augsburg for illustrations to a much grander, if similarly themed book project, the first German translation of the Remedies for Fortune Fair and Foul by the Italian fourteenth-century humanist Francesco Petrarcha. Cranach appears to have been familiar with the lavish illustrations by the unidentified Petarch Master, which were completed in 1520, as he appropriates them for these scenes of adversity and conflict between different creatures. The artist Lucas Cranach the Elder was a key figure in creating an infrastructure for spreading the message of Reform from the small, provincial town of Wittenberg. Besides producing large numbers of both painted and printed portraits of his close friend Luther, Cranach also designed book illustrations for Protestant publications from the early 1520s onwards. Cranach owned a paper mill and he was probably instrumental in drawing the Leipzig printer Melchior Lotter the Younger to Wittenberg. Until the two men fell out in 1524, Lotter’s press was located in Cranach’s large home in the centre of town, where this woodcut would have been printed. On the title-page of this pamphlet, putti flying amongst acanthus leaves are placed against a dark, hatched background, while two lions are resting without letting down their careful guard. Their tails are playfully entangled against the backdrop of a large wine leaf, which carries the title. That this whimsical imagery should be entirely unrelated to the pamphlet’s content, a Luther sermon, is fairly common for such tracts. Considering the fast pace at which these pamphlets were penned, it would have both taken too long and been too expensive to have a design matching the text cut into a woodblock. Purely ornamental borders, such as this, could instead serve more flexibly as the title-border for several publications. The image would have been printed from a single woodblock, while movable type would have spelled out the respective titles. Although several thousand impressions of an image could be produced from a single woodblock, over time, the lines cut into the wood would suffer damage from the repeated pressure exerted on them in the press. This wear and tear is visible here particularly in the upper right corner, where much of the background shading is lost because the fractured lines no longer carried sufficient ink to print them clearly. The title-page to the third volume of Martin Luther’s collected works, printed in Wittenberg in 1549, carries the symbols of the four evangelists, an angel for Matthew, a lion for Marc, a bull for Luke and an eagle for John, presumably to highlight that Luther’s writings are firmly rooted in the Bible and thus the word of God. Along the lower edge of the border, Christ is shown on the cross alongside the kneeling figures of Martin Luther in the dark robes of a Protestant pastor on the right and John Frederick of Saxony in fur-trimmed robes on the left. 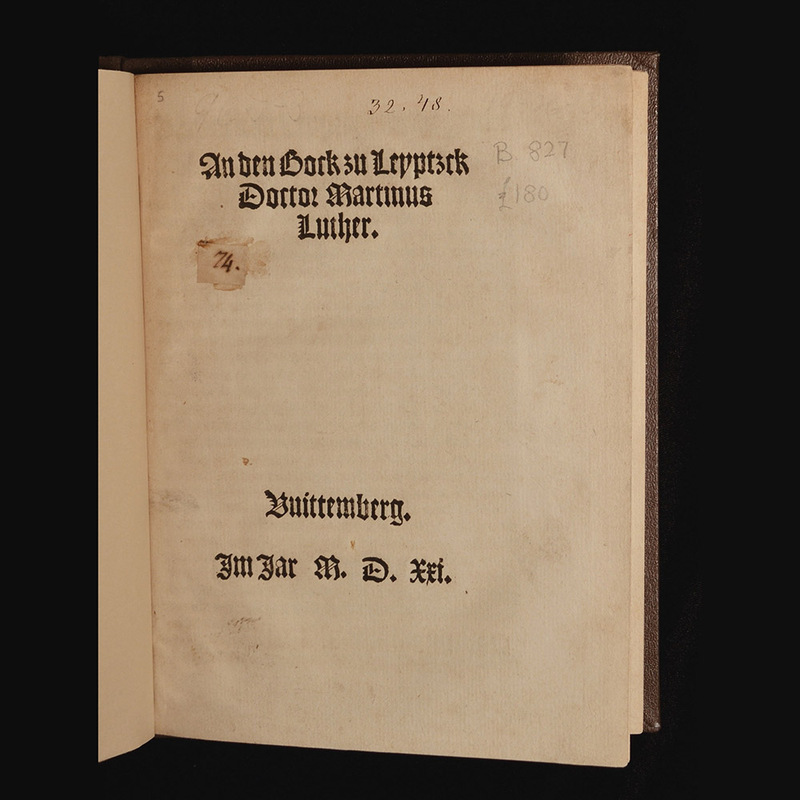 John Frederick had good reason to be included in this image: not only had he instigated the publication of this Wittenberg edition of Luther’s works, but he had also played a significant political role in the consolidation of Protestantism in the Holy Roman Empire. The Saxon electors had traditionally been powerful supporters of Luther’s cause: John Frederick’s uncle, Frederick the Wise, had sheltered Martin Luther at the Wartburg following the reformer’s imperial ban in the wake of the Diet of Worms in 1521. John Frederick, in turn, was leader of the confederation of Protestants, the Schmalkaldic League. He paid a heavy price for this support of Luther’s cause: in 1547, John Frederick was held prisoner by Emperor Charles V and sentenced to death, a punishment that was eventually commuted when John Frederick ceded his electoral title and moved his court from Wittenberg to Weimar. Lucas Cranach’s son, Lucas the Younger, would produce numerous prints and paintings showing Luther or members of the Saxon ducal family alongside depictions of Christ, such as the Weimar Altarpiece (c. 1553-55). 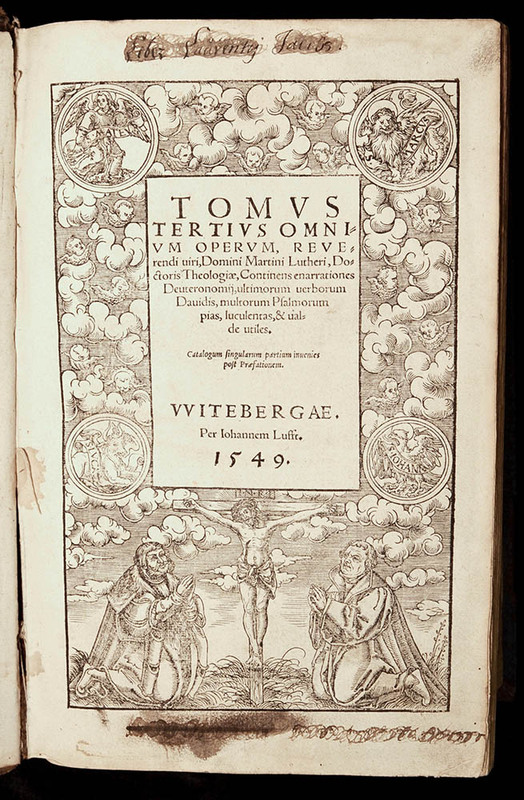 However, this woodcut from 1545 - as well as a similar composition on the titlepage of a New Testament issued in 1546 - were seized upon by Luther’s opponents, who accused him of venerating an image of Christ. Perhaps, the composition here still bore too much resemblance to earlier depictions of Catholic worshippers on the wings of late-medieval triptychs. The smudges along the lower and upper edges of the page are evidence of the book’s provenance: whereas the names of two owners have been crossed out, that of a “Lawrence Jacobs” (“Liber Laurentij Jacobs”) can still be made out at the top. 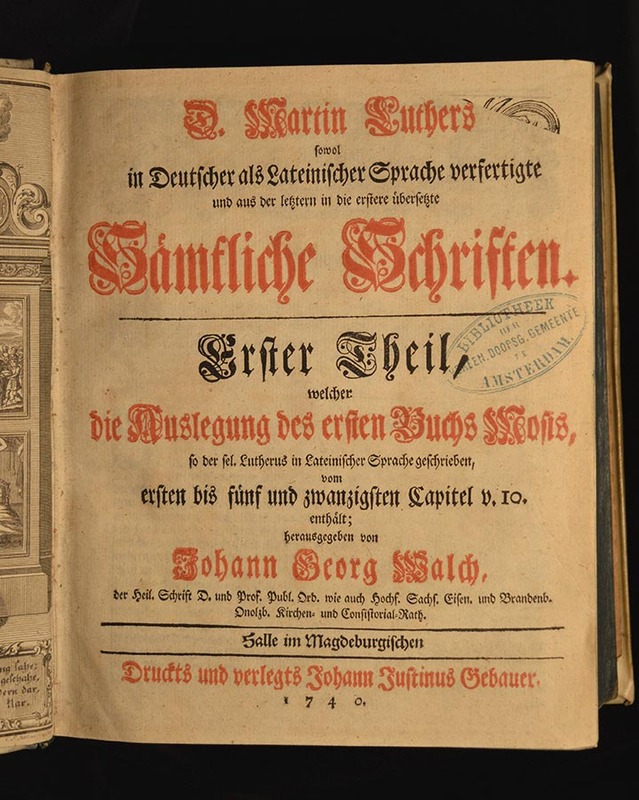 Between 1740 and 1753, the Lutheran theologian Johann Georg Walch published the collected works of Luther, including translations of his Latin texts in the German vernacular. 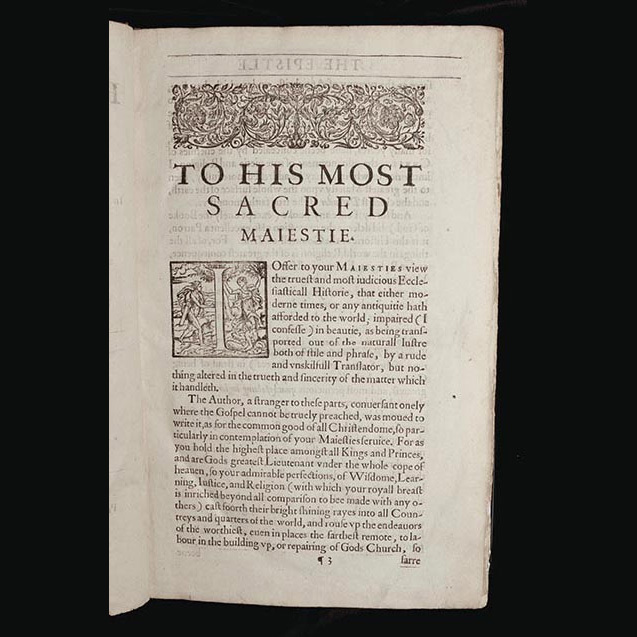 As this first volume contains Luther’s exegesis of ‘the First Book of Moses’, the print depicts Moses offering the book of Genesis to Luther. The Hebrew text at the top of the open pages (the book is shown upside down) is the Bible’s opening verse: “In the beginning God created the heavens and the earth.” (Genesis 1:1). 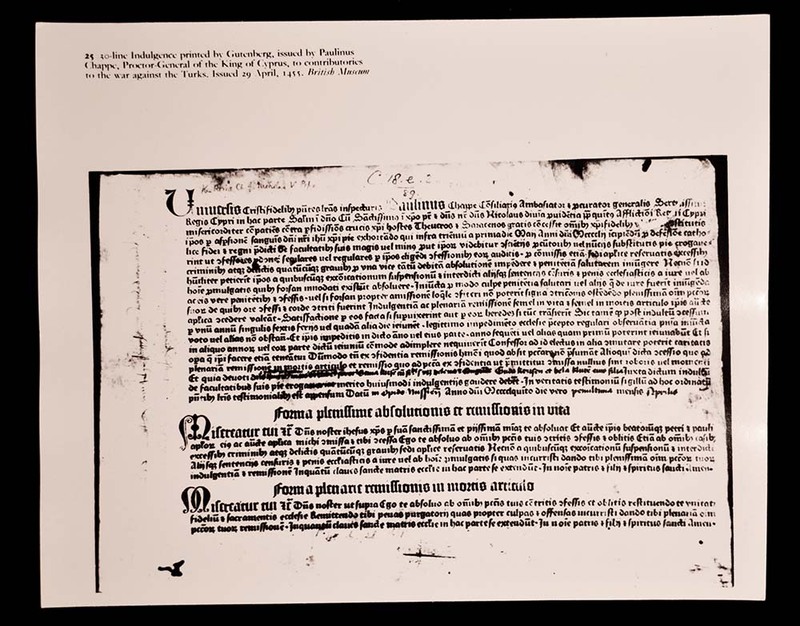 In 1525, Luther had issued his pamphlet Against the Heavenly Prophets in the Matter of Images and Sacraments in response to Andreas Karlstadt’s call for an absolute prohibition of images. Luther argued that “according to the Law of Moses, no other images are forbidden than an image of God that is worshipped.” The use of all other images as didactic and catechetical tools was acceptable. 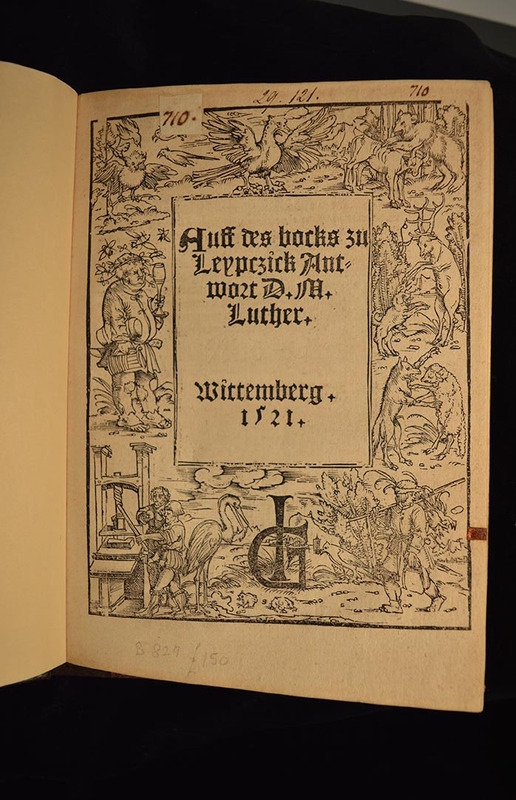 The frontispiece reflects both aspects of Luther’s teachings on images: For, with his right hand, Moses gestures upwards where a cloud appears with the Tetragrammaton, four letters spelling the Hebrew name of God (YHWH in Latin). The didactic use of images is obvious in the illustrations of the book of Genesis on the closed portal behind Luther and Moses: the roundels at the top on either side of the arch show Cain killing Abel and the Sacrifice of Isaac, both Old Testament stories which were commonly understood as a prefiguration of Christ’s sacrifice on the Cross. The panels below depict the Flood and Lot’s escape from the burning city of Sodom on the left, God (again in the shape of the Tetragrammaton) creating Eve and the Expulsion of Adam and Eve from the Garden of Paradise at the centre, and on the right the exchange of gifts between Abraham and Melchizedek, king of Salem (a story taken from the Book of Hebrews but referring to Genesis) and Jacob blessing the children of Joseph. Canones et decreta Sacrosancti Oecumenici et Generalis Concilii Tridentini, sub Paulo III, Iulio III, & Pio IIII, Pontificibus Max…, Paris 1666. Hopes for a church council to settle the issues raised by Protestants had circled as early as the 1520s. However, both political disputes and the papacy’s resistance to bow to its opponents’ demands meant that a council was not convoked until 1545. For the following eighteen years, Catholic church officials met for 25 sessions in the Northern Italian cities of Trento and Bologna. While political leaders, such as Emperor Charles V had intended for the council to be ecumenical, successive popes insisted on reaffirming their authority, clarifying central tenets of the Catholic faith and strongly condemning Luther and his fellow Reformers. 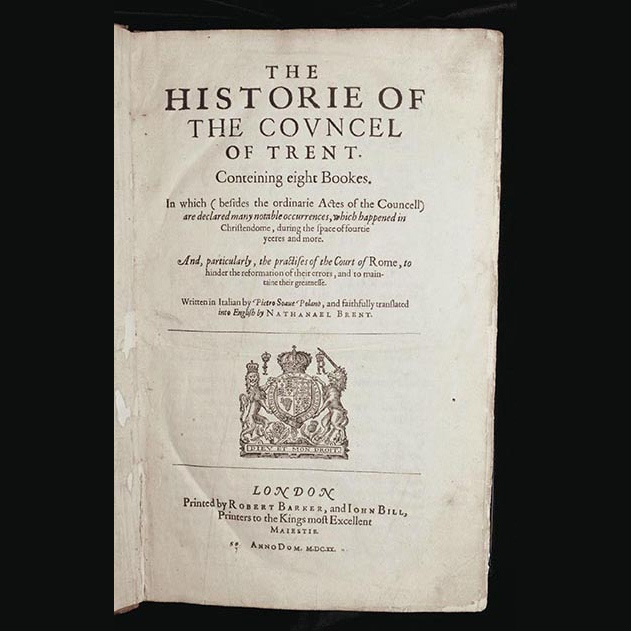 The council’s decrees were first published in Rome in 1564, with further editions soon appearing across Europe, both in the original Latin and various vernaculars. This Latin edition of the decrees was produced in Paris in 1666, but constitutes a reprint of an edition first published in Antwerp in 1640. The Antwerp edition was instigated by the chaplain of the Infanta Isabella at the Court of Brussels, Philippe Chifflet. 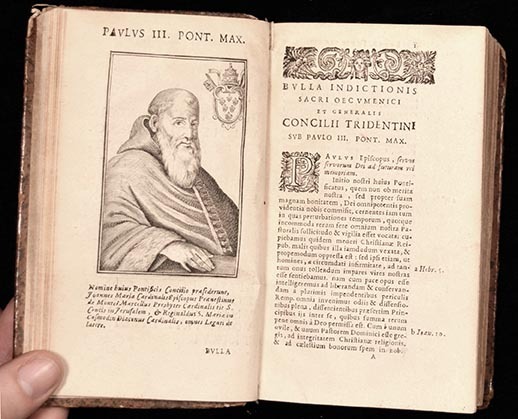 In addition to writing a new preface and additional notes on the text, Chifflet oversaw the commission of engraved illustrations, including full-page portraits of the three popes who had presided over the council: Paul III, Julius III and Pius IV. Chifflet showed particular ambition with respect to the book’s frontispiece. None other than the most famous contemporary artist, Peter Paul Rubens, was asked to provide a design. Rubens chose a portrayal of the council in session based on an anonymous Venetian print of 1563. Originally produced to record a diplomatic incident arising during the session of 15 July of that year over the seating of the Spanish and French ambassadors, the print’s depiction of the session in the church of Santa Maria Maggiore in Trento (indicated here in the print by the double arches on either side of the amphitheatre) would serve as the model for numerous other depictions of the council. The inclusion of the dove of the Holy Spirit in Rubens’s design is probably a reference to the opening declaration of each single session that it was “lawfully assembled in the Holy Ghost”. By extension, the guidance of the Holy Spirit therefore confirmed the divine authority of the decrees issued by the Council contained in the book. The frontispiece of the 1666 Paris edition was produced by a less talented printmaker, who undertook some amendments to Rubens’s design. Three allegorical figures, which were placed below the title of the 1640 edition were now inserted into the foreground of the depiction showing the council in session. The winged female figure to the right with a snake crawling out of her hair is probably an allegory of Discord, as the multi-headed monster next to her was likewise associated with vice and discord. To the left, a chained woman with a mask on the back of her head represents Deceit, whereas the old man behind her could be an allegory of Heresy. In his early seventeenth-century account of the Council of Trent, taking place between 1545 and 1563, the Venetian historian Paolo Sarpi quipped that the Holy Spirit must have travelled back and forth between Rome and Trent in a despatch box. Sarpi was critical of the portrayal of the council as an attempt to reconcile Catholics and Protestants. Rather than a true council of the church, Sarpi suggested, the meeting had been an exercise in strengthening papal authority and thereby the pope’s self-interest. The meeting had therefore been held not under the guidance of the Holy Ghost, but that of the pope. Sarpi’s critical view was remarkably close to Luther’s, who had expressed his concerns that the council would simply seek to reinforce the pope’s power when the meeting was first called. 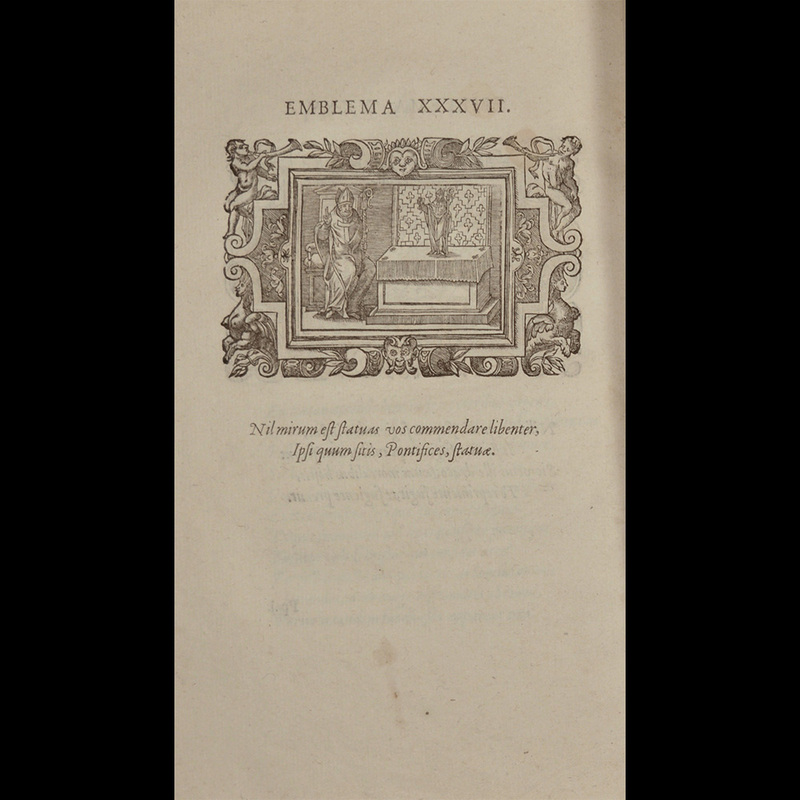 A year after the publication of the original Italian manuscript, an English translation by Nathaniel Brent was published in London. 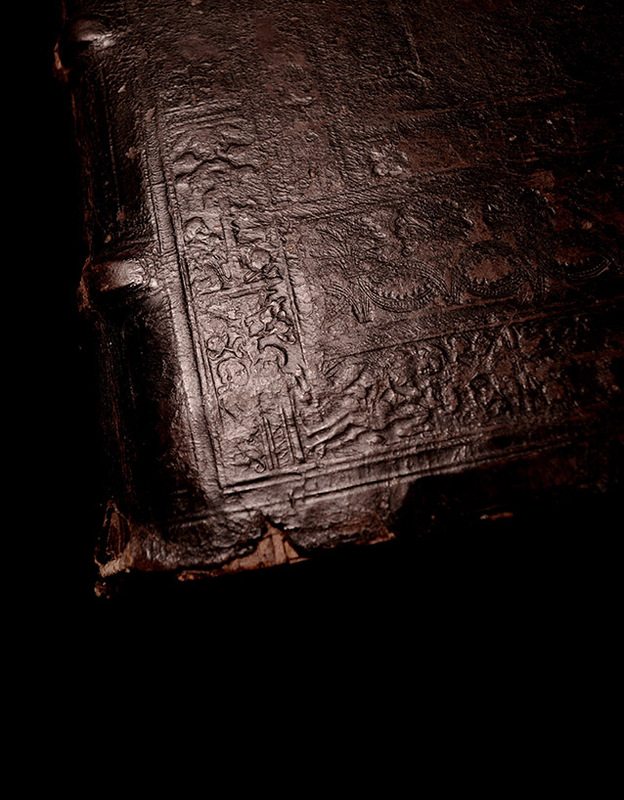 Brent believed Sarpi and some of his friends “were protestants in their hearts, though they durst not own it.” The titlepage shows the arms of James I, King of England, whom the book was dedicated to and who would have been particularly pleased with its anti-Roman tone. 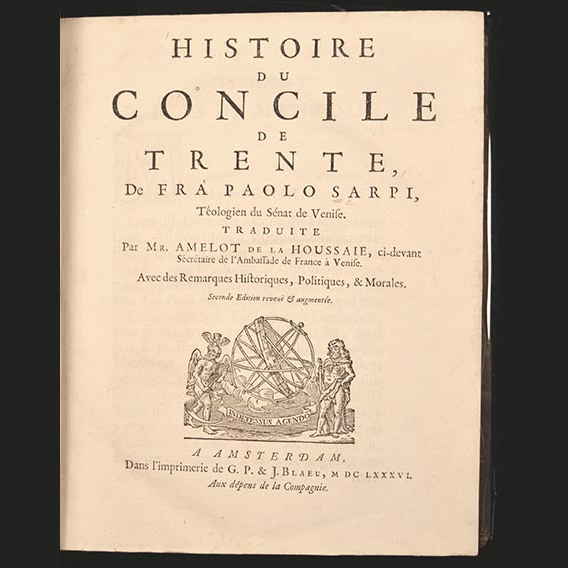 In his translation, Brent added that Sarpi’s history described “the practises of the Court of Rome” which served as a reminder to the reformers to avoid “their errors, and to maintaine their greatnesse.” After the first two London editions, the book widely circulated in Protestant countries and was translated into Latin, German, Dutch and French. The English Protestant scholar and poet of Paradise Lost (1667) John Milton called Paolo Sarpi “the great unmasker of the Trentine Council”. 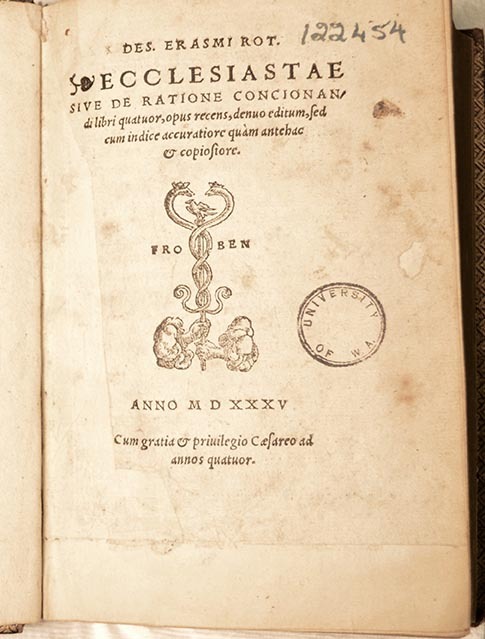 An English reader of the 1629 edition of the Historia del Concilio Tridentino clearly had Milton in mind when he scribbled in the margins of a discussion of indulgences (p. 7): ‘Paradise Lost Book 3 Limbo of Vanity’. 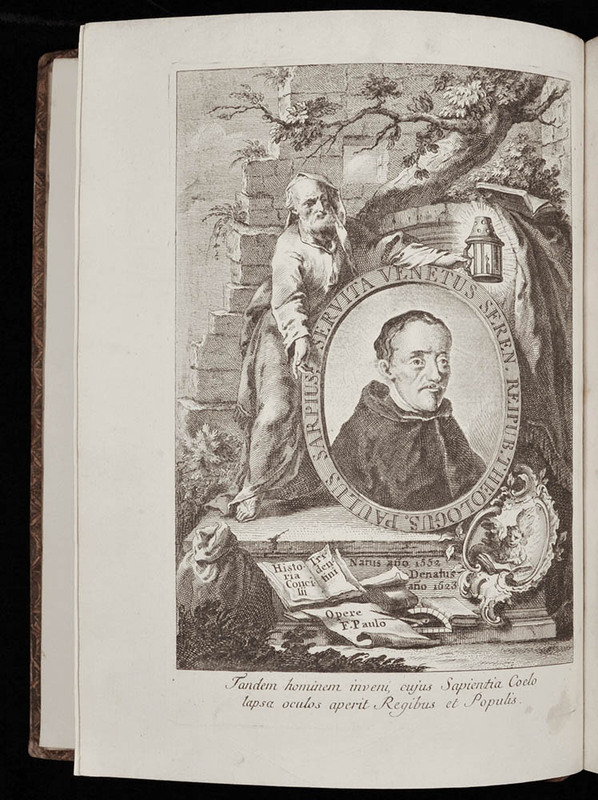 The Reid Library also holds Paolo Sarpi’s Opere (8 volumes, published in Verona between 1761-68), with an engraved portrait of the author.